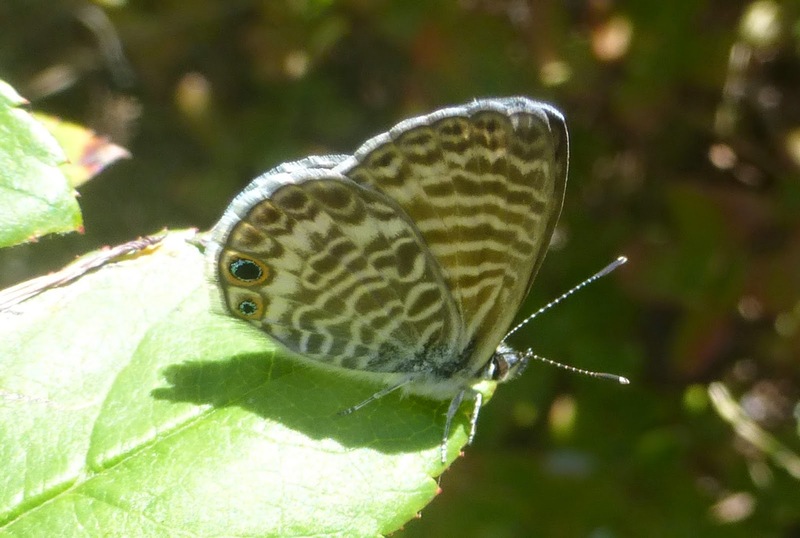 Early autumn is the season of butterflies in Malibu, and this year, even with the devastating drought, Swinburne's frail pale wings are visible everywhere. While everyone is familiar with the orange and black splendor of the monarch and the great gold and black swallowtails, there are numerous smaller butterflies adrift in gardens and open space that are less well known, but no less remarkable than their larger, showier relations. 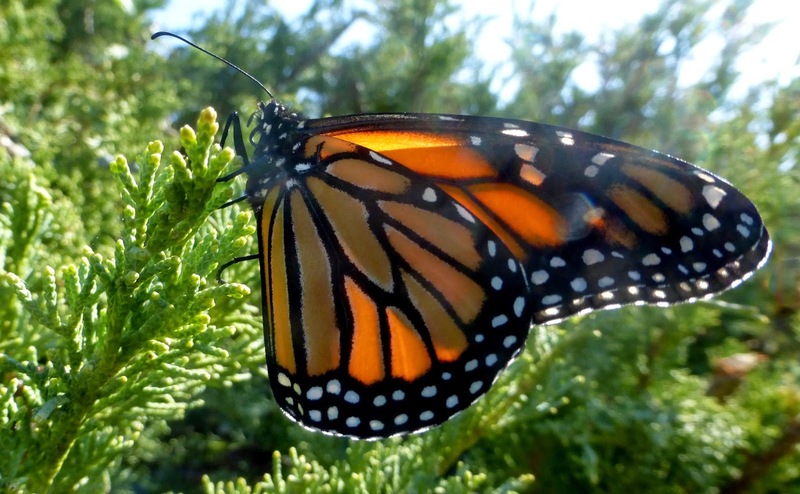 One of the first posts on the Malibu Post Blog was about monarchs, and I wrote a short piece about some of the more common local butterflies for the Malibu Surfside News in July of 2014, but there is a bewildering array of butterfly species in Malibu and the Santa Monica Mountains and the area may still be home to localized species that have never never been identified or even named. I'm still learning about the common "backyard" species. Most of us know them by sight, but it's nice to know the names of the neighbors. Here are a few species we see frequently in our garden here at the Post. A Lorquin Admiral, Limenitis lorquini suns itself on a dead mugwort twig. 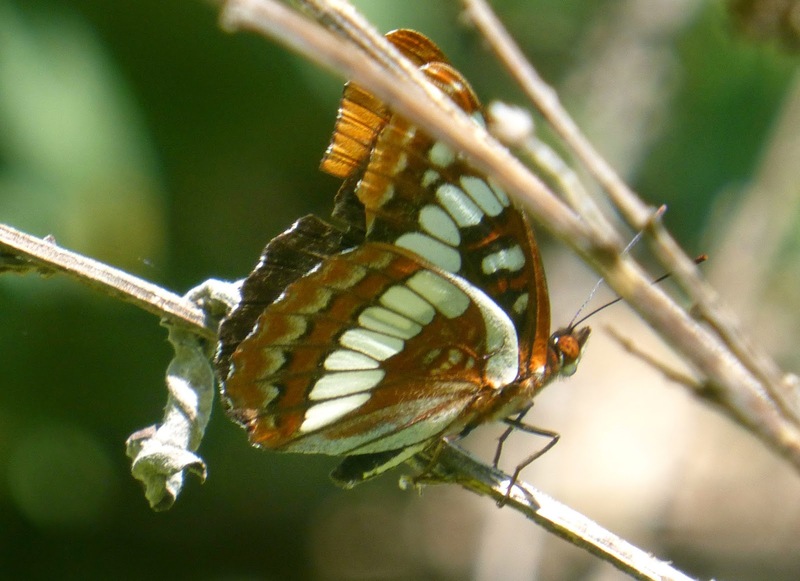 This is a spectacular medium-sized butterfly with black and orange markings on its upper wings. However, this one refused to open its wings. Lorquin admiral caterpillars depend on willows and cottonwood trees for their host plants, but the adults are attracted to many types of flowers and are sometimes observed feeding on animal dung or even bird droppings. Butterflies need the sun to regulate their body temperature. They are most active on warm, sunny days. Late morning and early afternoon in Malibu, when the morning marine layer has burned off, is the best time to look for butterflies. Monarchs aren't the only butterflies attracted to milkweed. 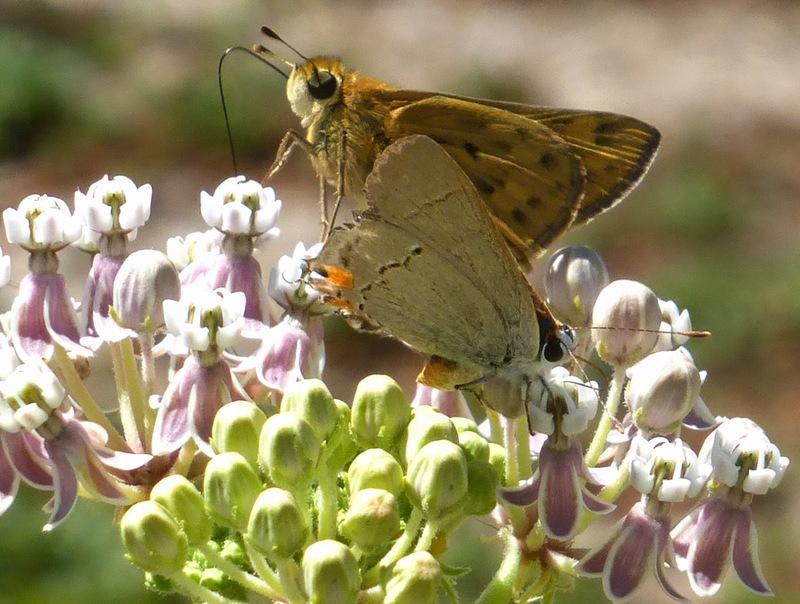 Here's a Fiery Skipper (in background), Hylephila phyleus, and a California Hairstreak, Satyrium californica, sharing a milkweed flower at the National Park Service's native plant garden at King Gillette Ranch. Both species are attracted to a wide variety of garden plants and wildflowers. However, the skipper's caterpillars feed on grass—including lawn grass, while hairstreak host plants include willow, oak and ceanothus. There was an abundance of painted lady butterflies in the Springs Fire recovery zone, taking advantage of the fire follower flowers after the brief winter rains this year. I think this is Vanessa cardui, the common painted lady found on every continent except Australia and Antarctica. There is a much rarer West Coast lady, too, which has a different pattern of white on the upper wings. Painted lady caterpillars seem to prefer thistles, but will also feed on legumes like vetch and the popular garden flower cosmos. Adults seek nectar from a wide variety of plants. This gulf fritillary, Agraulis vanillae, is a bit battered but still able to forage for nectar. Many butterflies, including this species, seem to be attracted to lantana, a popular tropical member of the verbena family. The yellow-flowering variety seems to be especially desirable. While native plants are critical for caterpillars, many butterflies are attracted to non-native garden flowers as a source of nectar. 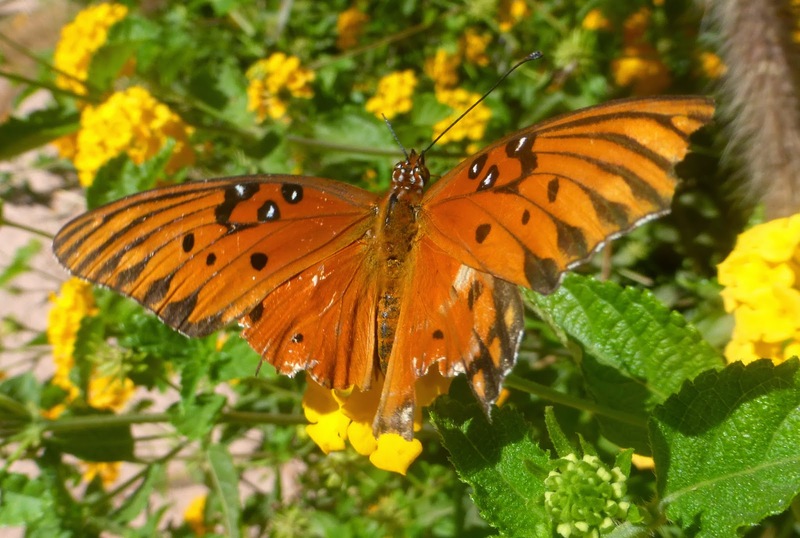 The gulf fritillary is an example of a species that is not native to Southern California but has become common because its host plant, the passionflower, thrives in California gardens. Unlike some other non-native species, this one does not appear to pose a threat to native species because it doesn't compete with the locals for host plants. This is the tiny marine blue, leptotes marina. Its wingspan is less than an inch across and its so light it is almost entirely at the mercy of the slightest breeze, but it's one of the most common butterflies in Malibu gardens and throughout western North America. The only blue on the side of the wing is in the eye marking, but the top view reveals a shimmer of iridescent ultramarine. A marine blue shows reveals its blue coloring. 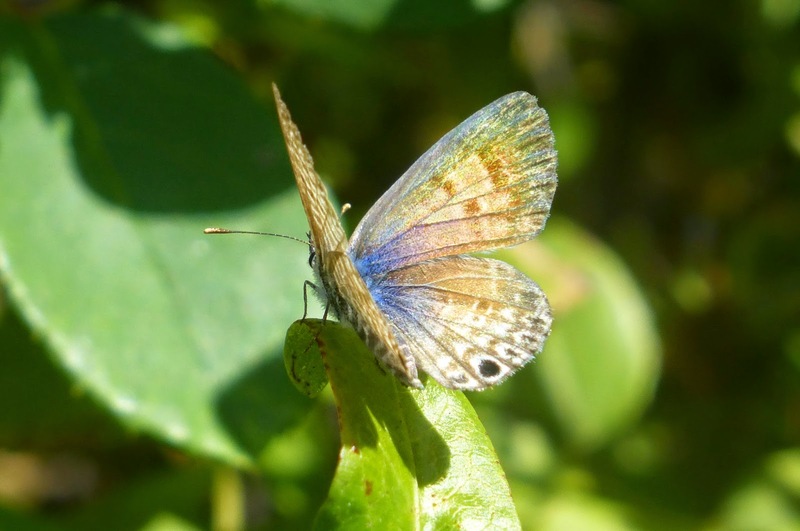 The butterfly guides say that this species' native host plants are usually legumes, but this small butterfly is attracted to plumbago, or leadwort, a popular garden flower, for nectar and as a host plant for caterpillars. 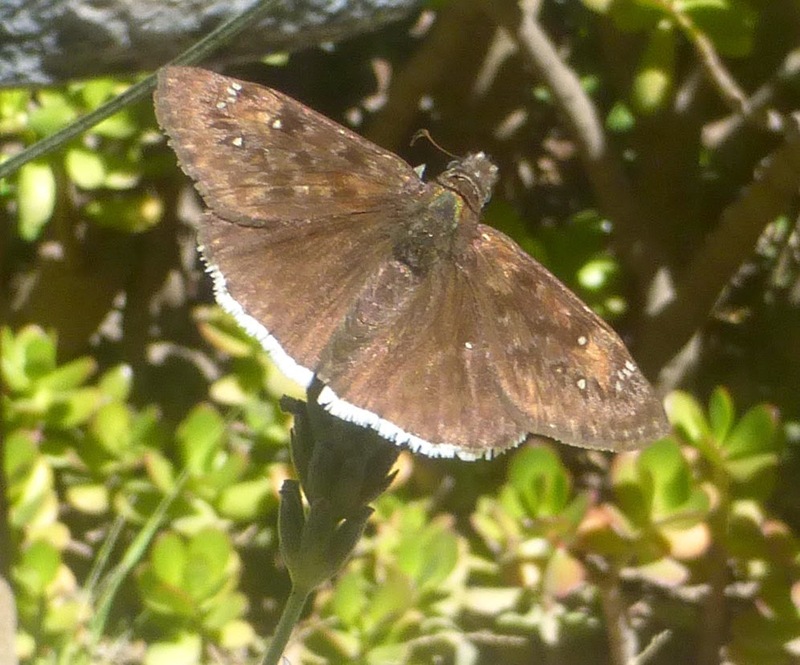 This small inconspicuous butterfly belongs to the skipper family, but it has two profoundly gloomy common names: the mournful duskywing and the funereal duskywing. Even its Latin name is dismal: Erynnis funeralis. There's the funeral again, together with Erynnis, presumably for the Erinyes, or Furies, the goddesses of vengeance in Greek Mythology. I have no idea why this unoffending butterfly was saddled with its name, except perhaps because its dark colors resemble mourning clothes. Its host plant is usually deerweed, and in our garden it is attracted to the flowers of the sages and mints. It's been a bumper year for sulphur butterflies. They seem to be everywhere—a flash of gold darting around the garden or among the trees, almost too quick for the eye to follow. 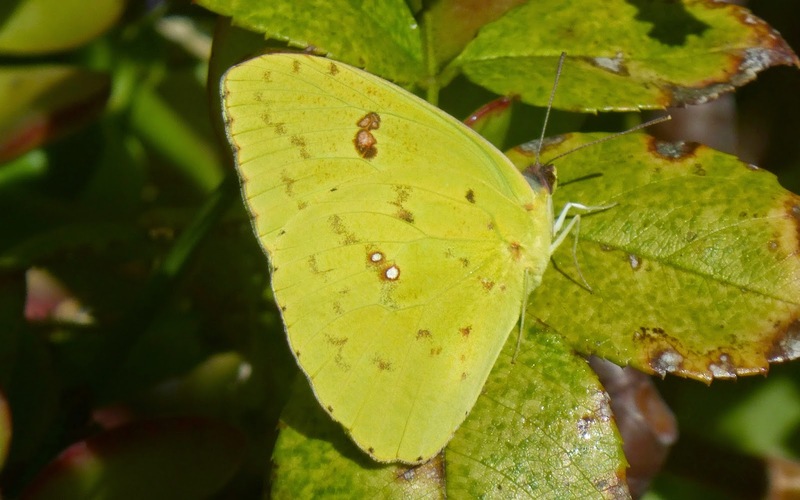 I think this is the cloudless sulphur, Phoebis sennae—there's another Greek god, this time Phoebus, the sun god, an aspect of Apollo. Adults are attracted to many garden flowers, including bougainvilla and hibiscus, but the caterpillars eat legumes, much to the sorrow of backyard vegetable gardeners who are often less than pleased to find fat green caterpillars in their pea plants. Butterflies aren't the only folk of the air, early autumn is the season of dragonflies. There is a vast number of dragonfly species, and I'm not going to even hazard a guess what these are. 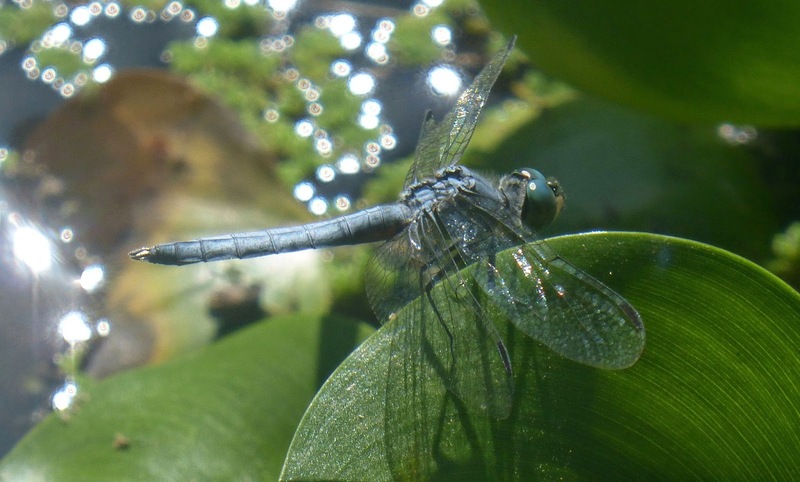 Dragonflies lay their eggs in water and spend the first part of their lives as aquatic insects known as nymphs. They are sensitive to pollution and are an important indicator species for stream health. They should be impacted by the drought. However, these living jewels seem to be everywhere, which is interesting because there are very few crane flies or even mosquitos—insects with a similar aquatic life phase—in Malibu this year. This is a damselfly, the dragonfly's smaller cousin, and one of the weirdest looking creatures in the garden. 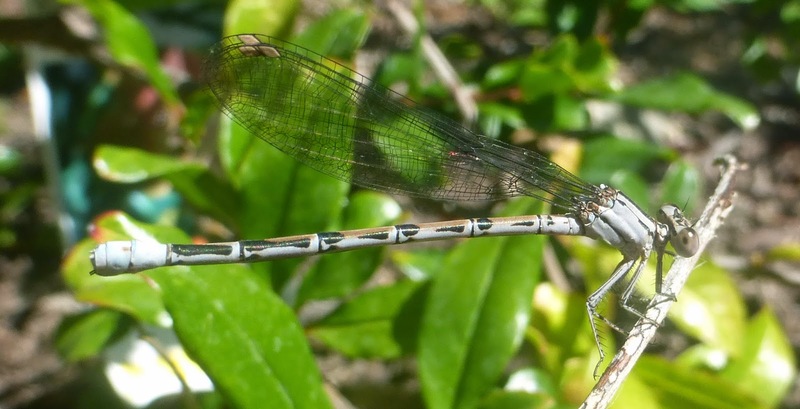 Like their larger relatives, damselflies are fierce hunters that prey on species humans view as pests, like gnats. Dragonflies and damselflies have amazing compound eyes with thousands of facets, enabling them to see in all directions at the same time. Here is the aptly named monarch. It's latin name also holds an echo of greek mythology, it's Danaus plexippus, for Danae, the daughter of the King of Argos, who was seduced by Zeus in a shower of gold. This is probably the best loved and most instantly recognizable butterfly in North America. It's also teetering on the brink of extinction due to habitat loss and the agrochemical business. Malibuites who are interested in helping the local monarch population are encouraged to plant milkweed and nectar gardens. 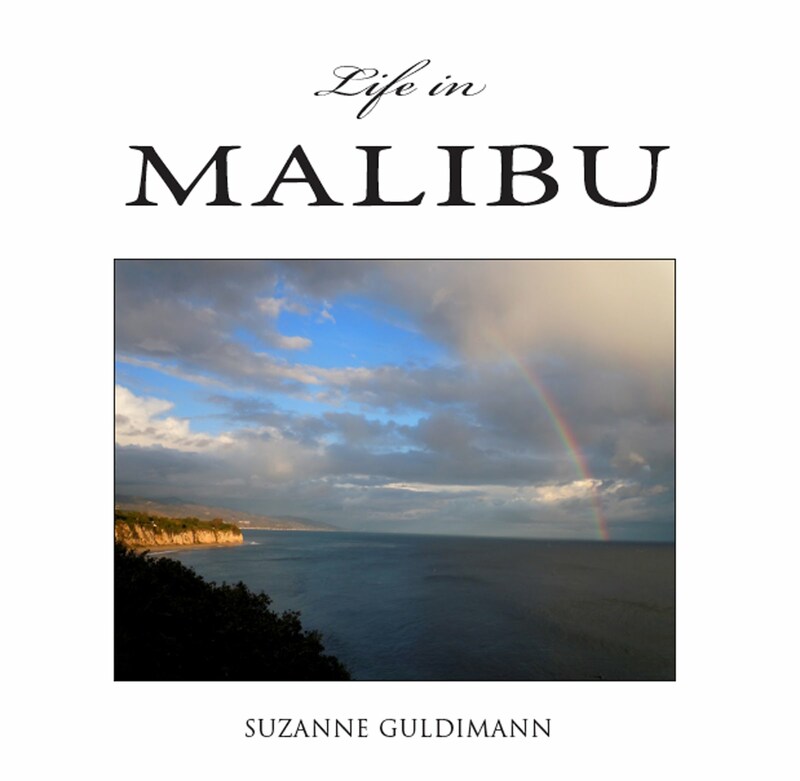 Information on how to plant a butterfly garden and local plant sources is available from the Malibu Monarch Project. There are many more species of butterfly our own backyards. They rejoice in common names like checkerspot and buckeye, wood nymph and metalmark, comma and dogface, orange-tip and cabbage white and the pantheon of ancient Greece and Rome lurk in their Latin names: satyrs and gorgons, gods and queens and Furies. Butterflies are a crucial part of the local ecosystem where they serve as pollinators and as an important part of the food chain for wildlife. For humans, they are a living symbol of transformation. 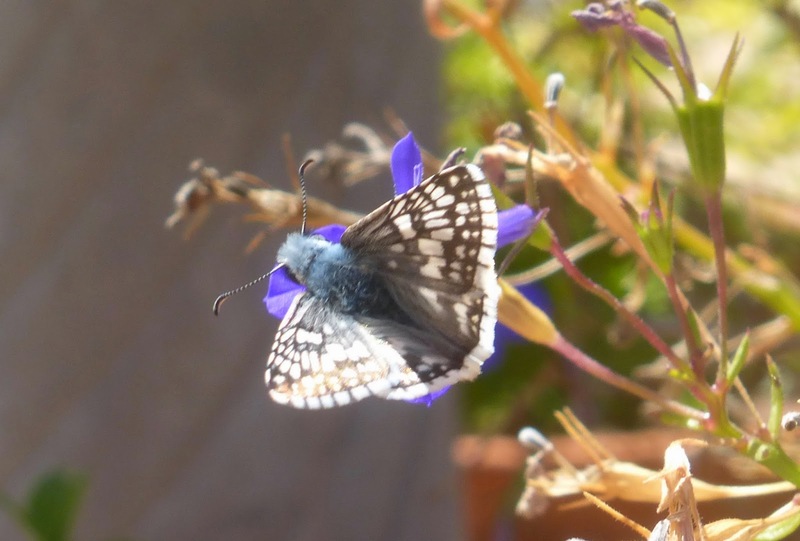 A checkered skipper, Pyrgus albescens, rests on a lobelia flower in the author's windowbox.